Reblogged from the Feminist Book Club blog. Tonight we discussed a book by one of my favourite authors, Margaret Atwood. The book was The Handmaid’s Tale, and re-reading it thirteen years later has not changed my opinion that this is a fantastic read. This is a story about women, about their roles in society both now, in the past and in the future. Offred is the protangonist and she tells her story slowly, and in snatches as if painfully remembering her past, whilst attempting to reconcile her existence in the ultimate patriarchal society. Unwomen, women who cannot conceive or have been deported to the colonies. There is also an underground set of women that work in a black market club, Jezebels. Women are used to police and control each other in a society created by men, and the women in it have little agency or autonomy. 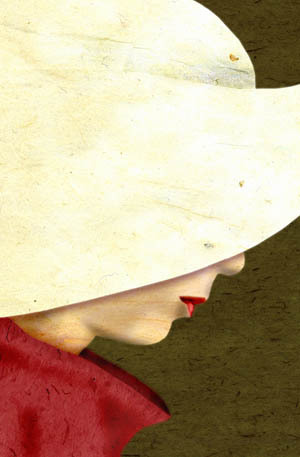 Atwood draws you in with Offred’s remembrances of her life in the state of Gilead before becoming a handmaid; a life that is remarkably similar to our lives now. She went to university, she had a child and partner, she was able to walk down the street and leave her state. In comparison, her life as a handmaid allocated to a Commander and his wife, is restrictive to say the least. Her whole function is to reproduce, without serving this function she will die in the toxic colonies. As the reader, I really wanted to know how this possibly could have happened in a society so similar to our own. So you keep reading Offred’s account, which is full of rich detail about her mundane, daily life and slowly, it is revealed how women’s right’s disappeared virtually over night. Atwood paints Offred as a sensualist, she enjoys the feel of air and water on her skin; the scent and sight of flowers and freshly baked bread or of Nick sweating as he cleans the Commanders car. Or maybe she enjoys these things because all other pleasure’s have been denied to her. Women’s reproductive function is of utmost importance in Atwood’s Giledean world, yet this it is controlled with a set of rules and regulations for who can procreate and how. This is explained because of low population levels, however, more tellingly, there is religious justification for the reproductive control of women and religious language and imagery permeates the book throughout. The references to Angels; the justification for the different sexual appetites of men and women ‘ God made them that way but He did not make you that way…Its up to you to set the boundaries. Later you will be thanked’ ; and the white and blue uniforms of the Wives, in comparison to the red of the Handmaids. This is a new form of conservative Christianity where priests are hung, along with those accused of ‘gender treachery’. In one chapter, there is a description of the fate of doctors that perform abortions; drawing a link with contemporary America and the Christian right’s attack on abortion clinics and those that work in these places. It is these links with our present that makes this tale so chilling and yet so realistic. We recognise the methods of control and the justifications given for them. The Handmaid’s Tale was written in 1985 whilst Atwood was living in Berlin, before the fall of the wall. Both America and the UK had elected conservative governments and there was an increase in Christian fundamentalism in the US. There were fears that the gains won by 1970s feminism could be undone. The Handmaid’s Tale was not intended as critique of women in Islamic states, however to what degree are there contemporary parallels with the religious justification of the removal of women’s rights in Iran and other Middle Eastern countries? Some may read The Handmaid’s Tale as a story of the resilience of women. Offred mentally attempts to keep her own identity even though her name, child, family, money and education have all been stripped of her. There is a secret society of women that pass information to each other. Throughout all her harrowing experiences and uncertain end, she remains in my mind as a whole, sensual woman. « Resilience- how to keep on bouncing back.